Billie Lawless is sick of lawyers. He is tired of that net of litigation, court dockets, and accusations that keep him defending, ad nauseum, his public sculptures--sculptures which incorporate sociopolitical content. Notorious in Buffalo, New York, for the monstrous moral and legal problems surrounding his public piece, Green Lightning, a piece which that city tried to destroy in 1984 before being slapped with a restraining order by the New York State Supreme Court, Lawless again found himself in court this past Fall--this time over a billboard-like public sculpture on display in Columbus, Ohio. This latest controversy hinges on a riddle posed by the "experts" on the Columbus Graphics Commission: when is a public sculpture not really a sculpture but a sign? On October 18, 1988, by unanimous a vote, the commission declared Lawless' piece Didy Wah Didy a sign, erected illegally without a permit. It did not seem to matter that Didy Wah Didy was part of last summer's annual outdoor exhibit situated in the sculpture garden at Heritage Village, a retirement community in Columbus. Curated and coordinated for the third year in a row by Marty and Pauli Greenberg, "Sculpture at Heritage Village" contained earthworks, installations and traditional sculpture by 32 well-known regional artists. What could have been just a bureaucratic dispute between Heritage Village and the City of Columbus has escalated into a vicious court battle. Greenberg, who understandably wants to maintain a working relationship with the city, believes Lawless is a troublemaker. Lawless believes Greenberg and Heritage Village broke an agreement and did not properly defend the piece as art. In August, Lawless was charged with a third-degree misdemeanor for failure to comply with a local sign ordinance. On October 7, the artist was informed that the sculpture was to be bulldozed--this after Fran Resch, arts administrator of Heritage Village, had covered the piece with a tarp--damaging it in the process--a few days after the exhibition had officially closed in mid-September. But Judge Lew Williams of Common Pleas Court signed a temporary restraining order October 12, prohibiting the city from tearing down the work or unplugging the neon. Lawless had a timer on it until October 28. The case came up for trial November 1, and proceedings were still going on as of early December. "You start looking for entrails, omens," says Lawless, who has received letters and calls of support from around the country, including one from Athena Tacha, whose sculpture was recently destroyed by city workers at the Columbus airport. "I believe that there is something going on in Columbus that is detrimental to outdoor art and artists. Somebody has to take a stand." Lawless' case is even more significant in light of Mayor Dana Rinehart's recent attempt to "give away" Roy Lichtenstein's Brushstrokes in Flight to Columbus's Italian sister city Genoa. (See "Artnotes," New Art Examiner, Summer 1988.) As one artist put it, " It hasn't been a great summer for public art in Columbus." There are two ironic things about this case. Greenberg originally asked the city if a permit was needed for a neon sculpture installation. The answer was "no." But apparently someone complained to the city and "they (city officials) were obliged to cite us," says Greenberg. Lawless (and others) is convinced it is the blackly humorous, essentially anti-nuclear message of the sculpture that has people rattled. Didy Wah Didy, named after the last stop on a mythic railroad bound for hell, sits close to the east-west highway Interstate 70, where tens of thousands of people can see it. 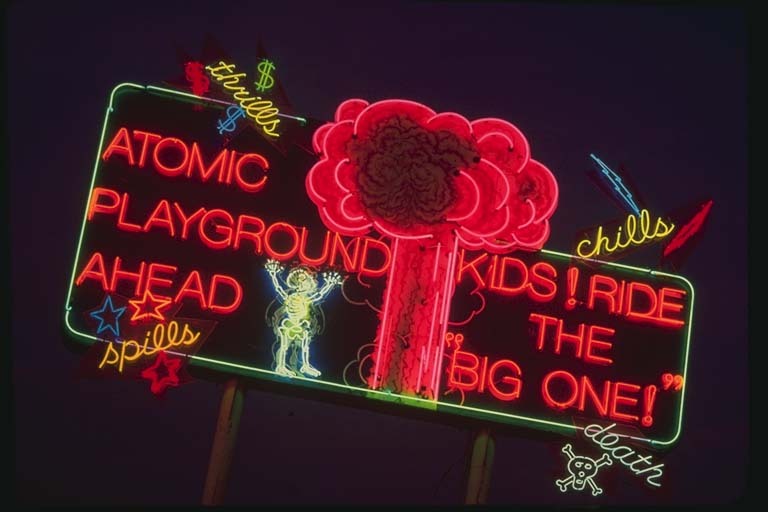 In a 35-second sequence, the words "Atomic Playground Ahead" and "Kids! Ride the Big One!" flash alternately with a mushroom cloud, the outline of a child which turns into a skeleton, and the words "thrills," "spills," "chills," and "death." Deemed both a sign and a traffic hazard, the city just wants it torn down. However--and this is what bothers Lawless the most--Heritage Village would like to keep the concrete base he built for the piece intact, presumably for a less "controversial" sculpture to be shown next year. According to sources in Columbus, the City Graphics Commission exercises its power discriminately. Mary Kilroy, a Columbus attorney who has represented others under this code, says, "The city uses it to prohibit peace and anti-nuclear demonstrations. However, the graphics code isn't used against club owners, anti-abortionists, or mainstream politicians." Lawless' lawyer, John Marshall is banking on this inconsistency to help his client. He has subpoenaed the city to produce permits for other outdoor artworks in Columbus, including the previously mentioned Brushstrokes in Flight, Stephen Antorako's Neon for Columbus Museum of Art, a Henri Morre piece and others by Jonathan Gilber, Jack Greeves, Sanders Schultz, and William Severson and George Greenarmyer. Marshall believes this to be a First Amendment rights case, with selective enforcement of an unconstitutional statue. "They offered me what they thought the damage to the piece was--$100," says Lawless. "But they didn't call in a curator to estimate the damage, they called a signmaker. So I can take $100 or sue. If I win, the piece stays up until April, turned on. If I lose, the sculpture comes down. In the meantime, Lawless is fielding questions from National Public Radio, Sculpture Magazine, and others, furthering the heated, never-ending debate over public art--especailly in Columbus. Amy Sparks is a poet, artist, and freelance writer who contributes to the New Art Examiner, High Performance, Dialogue, poetry journals, and Cleveland area publications.